I generally don’t like to dwell on the past. What would have happened if Earnest Byner hadn’t been stripped of the ball? If Jose Mesa had gotten a ground ball from Charles Johnson or Craig Counsell? If Joel Skinner had sent Kenny Lofton? It didn’t happen. That alternate reality will never exist. So what’s the point in lamenting it? We have what we have, so let’s make the best of it. Yet, in those quiet moments of lucidity, I can’t help but dwell on a small portion of the recent past. 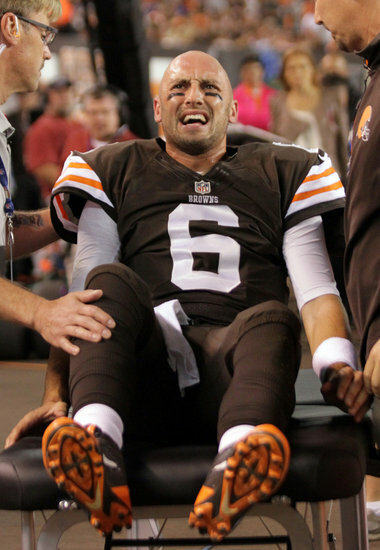 I can’t help but wonder what might have come of this Browns season if Brian Hoyer’s knee had stayed intact. Heading into that Thursday, Oct. 3 game against Buffalo, Hoyer had been the freshest breath of air Browns fans had experienced in six years. The Browns didn’t look like world-beaters, but they certainly resembled a confident, competent NFL team since he had taken the reins and led the team to a come-from-behind Week 3 win at Minnesota. Hoyer had been the third-string quarterback on the depth chart. Rob Chudzinski surprised a lot of people when he vaulted over second-stringer Jason Campbell to give Hoyer the starting nod after Brandon Weeden had injured his thumb in a second-week loss to Baltimore. But Hoyer quickly made Chud look like a genius. He seemed to be a hand-in-glove fit to Chud’s offense. He made quick reads, quick throws, moved the ball and scored points. In the span of two weeks, the Browns went from resembling their same old sorry selves to resembling a team that could make some noise in the AFC playoff picture. 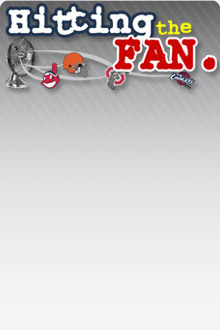 That Thursday night game capped a crescendo of a week for Cleveland sports, after the Indians had clinched a playoff berth that Sunday, and hosted their first playoff game since 2007 that Wednesday night – the first playoff game Cleveland had hosted in any sport since May 2010. The Indians lost under the national prime-time lights, but the following night, the Browns put the city right back under the national spotlight. And this time, we had a football team worth showcasing. Then, barely five minutes into the game, Hoyer was flushed out of the pocket. He scampered for the first-down marker near the sideline, but his knee buckled as Bills linebacker Kiko Alonso tackled him, rolling over him in the process. The initial reports said Hoyer might have a ligament sprain in the knee. Maybe he’d only miss a few weeks. Then we heard he might have torn a ligament. Maybe a partial tear? Maybe, hoping against hope, it wasn’t a season-ending injury? But the next day, we found out he had torn his ACL and was done for the year. And all the air went out of the Browns season. All of the losing, negative inertia that has provided the wind for this franchise’s sails for the past decade and a half was jostled back into place. We were destined for more of the same old Browns. It was more devastating than your typical season-ending injury to a key Browns player. It was more devastating because the various Browns leadership regimes have been on a 14-year quest to solve the quarterback position. Nothing has dogged this franchise more than poor QB play, and Hoyer, at the very least, offered a glimpse of what this team could be when not sabotaged by lousy QB play. Hoyer’s two games and change as the Browns starting QB was a much-needed corrective lens that allowed us to view the rest of the team in a realistic light. When healthy, motivated and not assailed by the endemic “here we go again” losing culture that has anchored itself in Berea, the Browns are actually a decent football team. They’re not ready to contend for a Super Bowl by any means, but they have quality talent at some key positions. This is not a barren roster. But it’s a roster that is going to play well below its potential if it has a low-performing QB at the helm. Now that we’ve seen it, it’s encouraging and agonizing at the same time. We’ve seen what the Browns can be, but we’ve also seen how much it hinges on finding a quarterback who can play the position at a relatively high level. And we’re not talking Tom Brady or Peyton Manning here. Hall of Fame credentials aren’t necessary. We’re talking about someone of the Andy Dalton class. Just good, not necessarily great. If Hoyer had stayed healthy, maybe we’d have found a solution at quarterback. Maybe the Browns brain trust wouldn’t feel the need to roll the dice on drafting a QB in a 2014 class that is being touted as one for the ages, but looks kind of iffy when you get down to it. Marcus Mariota’s decision to stay at Oregon next season isn’t helping that cause. If Hoyer had stayed healthy, maybe the Browns are 7-5 and in the thick of the AFC wild card race, instead of 4-8 and playing out the string. You’d certainly have to think that the Browns could have beaten the Lions and Jaguars with better QB play. Maybe they could have stunned the Chiefs, who only defeated them by six points. Maybe one of those divisional blowouts against the Bengals and Steelers turn out differently with better QB play buoying the confidence of the entire team. If Hoyer had stayed healthy, maybe this would have been a season of real progress, if not a playoff berth. Instead, we get the usual doses of opacity and uncertainty as the Browns stagger toward free agency and the draft, to be followed by minicamps, until we arrive at training camp at the end of next July. Hoyer will be there. Who knows what shape he and his knee will be in after nearly a year of rehab, but he’ll be there to compete with whomever the Browns trade for, draft or sign in an effort to create a quarterback competition in camp. And we’ll begin the cycle all over again, hoping to find answers where there have only been questions, fortune where there has only been misfortune, wins where there have only been losses.